To help save your time and effort, AMZFinder can send review request emails automatically. Once you complete setting up your email rules, your emails will be automatically sent out everyday. Click on Customer Email > Email Rules on the AMZFinder dashboard. Click on “+ Add Feedback Request Rules”, choose an email template, then edit the rules. Rule Name: Customize a name for the email rule. Template: Choose a template that the rule is applied to. Target Marketplace: Choose a store to apply the rule. Send After Purchase Date: Specify when the emails get sent out. Input a number, say 7, then the review request email will be delivered to buyers 7 days after their orders were generated. For example, if a buyer placed an order on January 31st, 2018, then the email will be set to be sent to that buyer on February 6th, 2018, then the next day emails would be sent to buyers whose orders were generated on February 1st, 2018. Status: Change the status of the rule once you have finished setting up. Your emails will be sent out once you have set the rule status to “Active”. Set the status to “Disable” before you complete setting up the rule. Fulfillment Channel: Choose a fulfillment channel that the rule is applied to. 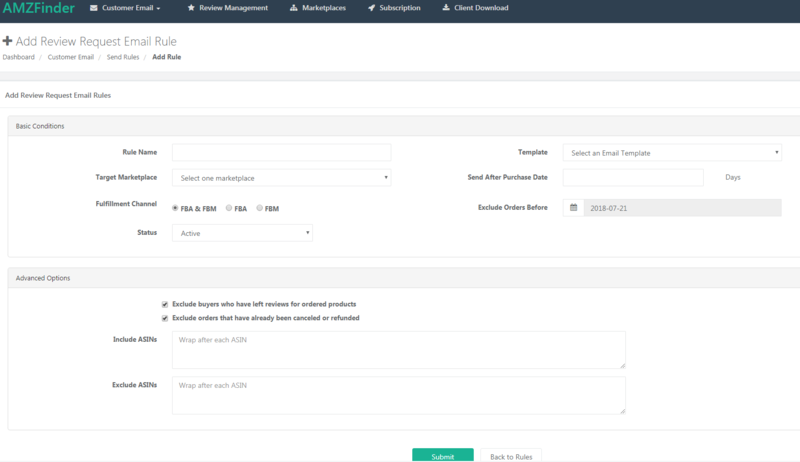 Exclude Orders Before: Filter out orders that are generated before a particular date. This rule helps you exclude certain buyers from your emailing list, such as those who have already left a review, canceled their orders or have been refunded. You can also enter specific ASINs to exclude. AMZFinder will generate an individual email address for each Amazon marketplace. Please manually add the email address to the approved sender list on Amazon Seller Central. Click the following URL to check if the email address has been added successfully.